Many paint stains can be removed with tools and materials you probably have in your home already The method you'll choose to remove paint stains from wood depends largely on how porous the wood surface is, and the type of paint. Oil-based paint will be more difficult to remove than water-based paint, and paint won't penetrate smooth wood such as maple as much as it will open-grained wood like oak or mahogany. Start with the easiest and least labor-intensive method first, and use harsh solvents as a last resort. Identify the type of paint, if possible. Water-based cleaners will have no effect on oil-based paint, and mineral spirits won't remove latex (water-based) paint. Rub the paint stain with isopropyl (rubbing) alcohol, the kind available at drug stores and pharmacies. If it softens and starts to remove the paint, it's water-based. Isopropyl alcohol will not remove oil-based paint. Mix hot water and mild detergent in a bucket. Scrub the stain with an abrasive kitchen sponge. Use very hot water--saturate a rag and leave it for several minutes over the dried paint to soften it before scrubbing. Use chemical paint remover or acetone for oil-based paint and stubborn stains. 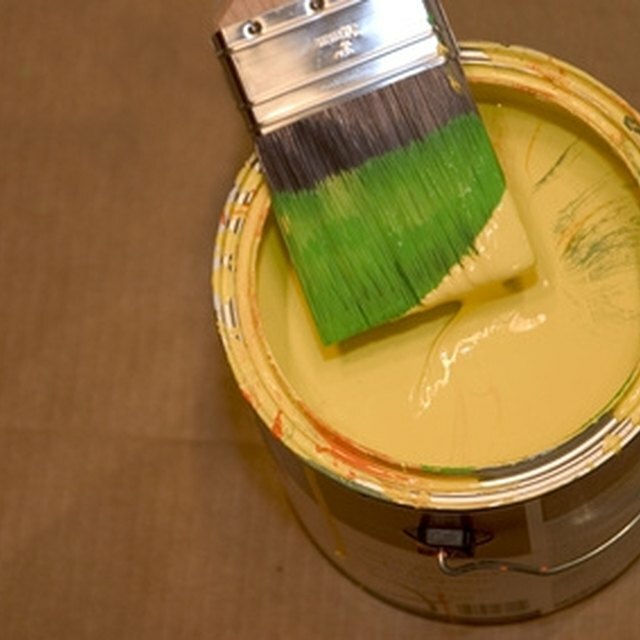 Some paint removers are gentle, using citrus oil to soften and lift paint. Most paint removers are brushed or sprayed on the stain, allowed to work for 5 to 15 minutes, then cleaned or scraped off. Follow label directions. Use a toothbrush or wire brush to gently scrub the paint from the wood grain. Work with the grain of the wood instead of across it so the bristles can scrape the paint out. Sand the wood, if there is still a stain remaining after you've worked at it with other methods. This won't remove the paint stain, but will remove the stained surface of the wood. If the paint is more of a blob or drip, try using a paint scraper or the edge of a credit card to scrape it from the wood. Acetone is the main ingredient in nail polish remover, which will remove both oil- and water-based paint from bare wood. Paint remover and acetone will destroy any underlying finish--only use it on bare wood unless you are planning to refinish the entire surface.